The new fabric is here! The new fabric is here! In my head I'm hearing Steve Martin's excited voice proclaiming that the new phone books are here – but in my case it's fabric! It's not all here, but this is the first taste. This box is from Blend Fabrics. Most of the fabric is designed by Maude Asbury. The reindeer and the tree fabric are especially wonderful! This is the first wave from Moda (below) – there's more Moda fabric coming. I got a box from P&B today. Boxes should be arriving soon from Westminster and Free Spirit. As I said in a previous post, I'm concentrating on dots, a very few large prints, and the occasional non-dot print that was just too good to pass up. I'm choosing fabric that I can and will use myself. Some of the fabric I have coming can be re-ordered and some will be gone when it's gone. I don't have any control over how long any of these will be in stock. If you'd like to see what's up now, click here. I'll upload more fabric as it comes in. I hope you like the new fabric page layout. Pleae note that you order fabric by the half yard. I do hope it makes sense. If it doesn't, please let me know so that I can tweak the pages. We'll add fat quarter bundles in about 3 few weeks. This weekend Chris and Lorna's good friend, Nathan, is getting married and we're all involved in the event. My neice graduates from high school on Sunday. We're taking mom and with the drive to Ft Worth and back we are looking at a very long day. I'm taking applique. Really, does anyone like sitting through a graduation? I really enjoy the short moment when the person I care about walks across the stage but the rest is usually mind-numbing. There ought to be a better way but I can't think what it is. If you order fabric now it may go out on Monday because of the wedding. Next week I head to California for two weeks of work. When I get home we'll work on fat quarter bundles. But if more fabric comes before I leave I'll put it online so you might want to check back every now and then. It's good to be busy, isn't it? Oh, is that some text I see there? This will be fun. I can’t wait for a Piece of cake FQ bundle! I am very bummed that your trip to SoCA coincides with CA graduations and parties. Next time! They look so lovely !!! Oh goodness those dots are calling my name. 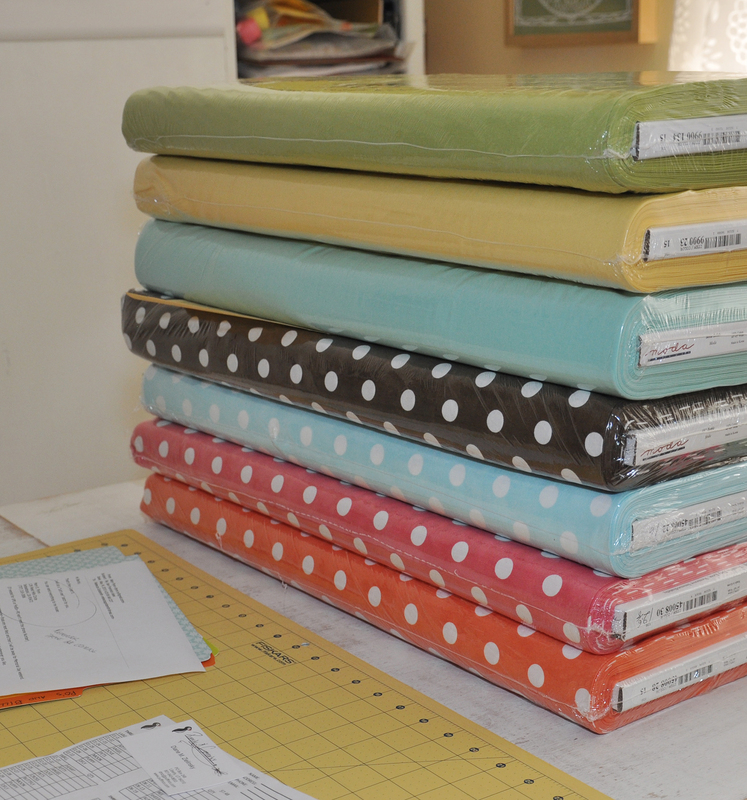 Several of those fabrics are calling to me – but I may wait until the bundles are done. Enjoy the next couple weeks! Oh, and in case you’re wondering, Lorna does a fantastic job of getting the orders out! Thanks for the heads up. Ill work on them tomorrow. Right now were heading to a graduation.